My cousin who is brought up in Bhopal moved to Pune. She is used to eating pretty authentic Punjabi food and she & her hubby went to a supposedly "good" Punjabi restaurant in Pune. They ordered 'Maa ki daal' and when the order arrived.. my cousin saw a curry leaf in the Maa ki daal! Her reaction was: "Kadhi patta in Maa ki daal????? - Kabhi Nahin!!!!" My 10 year old niece from Mumbai started missing chatpati bhel-poori during her 1 month visit here.. we were in a food court of a nearby mall and she saw bhel on the menu of the typical north indian shop in the food court.. in spite of our warning my niece ordered the bhel and found cucumber pieces in her bhel! - you guessed right - she said "Cucumber in bhel?? Kabhi Nahin!!" I went to a popular Indian snack shop - I had heard that they have Vada Pav on their menu... pretty excited I ordered the much hyped Vada Pav... the Vada pav was "wrong" (read as not something I am used to) on so many levels - where do I begin? - They have fresh baked pav.. but they use a bun instead!, the masala in the stuffing tastes similar to their dabeli masala.. they don't put tamarind-date chutney in the vada pav but put green chutney.. and to top it all they put fresh cut onion in the bun - like a burger. My reaction was - what you are serving tastes alright - but please.. please don't call it vada pav!!! 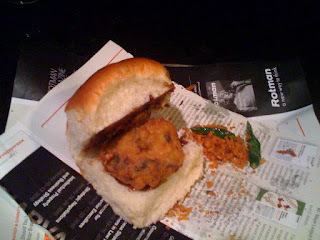 To each his/her own I guess - I made Vada Pav for myself.. and of course Shank hogged on it too! I will end this long story with a funny incidence..
My brother and his friends went to watch 'Darr' back in India and got thoroughly bored by the movie and especially by Shahrukh's kakakaka Kiran.. so total tapori style they started shouting out their own dialogs in the middle of the movie... At one point Shahrukh asks his Mom (direct call to heaven).. "Pata hai Maa.. maine Kiran ko pehli baar kya gift diya?"... and my brother's gang shouted "Vada Pav!!" 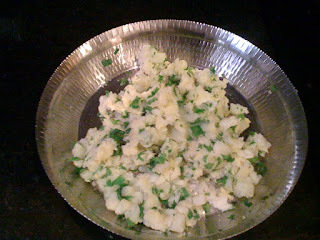 Add ginger-garlic paste and cut coriander leaves to the boiled potato pieces. Add salt to taste and keep it aside for a few minutes. 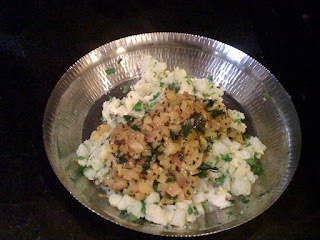 Make tadka in a pan - heat the oil - add mustard seeds - as they start to crackle, add green chilies and curry leaves. As the curry leaves start to splutter add turmeric powder and cut onion. Mix well. 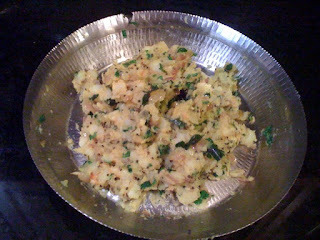 As soon as the onion becomes soft add the tadka on the potato mixture and mix well.. in the process of mixing the potatoes will be half mashed - which is ok! Heat oil in a large pan. 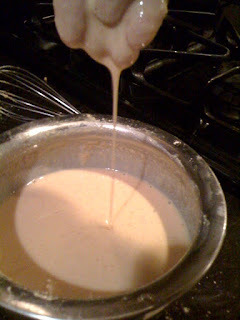 Test whether the oil is hot by putting little dots of besan coating in the oil. They should rise to the top immediately and turn light brown in a minute or so..
Take a 2 tbsp of the potato filling and make it into a flat round shape. 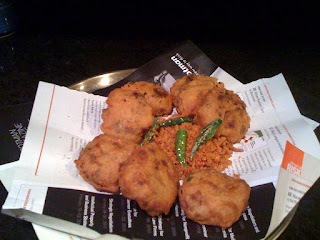 Dip it in the coating mixture and put the Vadas in the pan for deep frying..
Fry till reddish light brown in color. Put tamarind-date chutney on the pav, add the red chutney if you have made it.. then add Vada and enjoy along with shallow fried green chilies..
Shanu made it on Sunday (oscar food!). No tamarind-date, only dry garlic chutney for me. :) nice.. perfect for oscar night..
Now I get it. That is when my craving started... after I saw your pictures. The assembly was Devanshu's work and I think he did a great job on that, perfect combination of butter & dry garlic chuttney. Love the idea of blending the besan dots with the garlic chuttney, will try it next time. Thank you Sunita, Shanu and Devanshu for the comments!